Smooth jazz-loving private investigator Varian Pike meets enlightened, poetry-quoting thief Ronnie Hayes at the very beginning of the excellent new P.I. 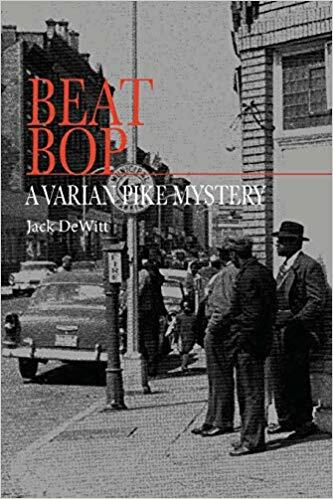 mystery Beat Bop, by master storyteller Jack deWitt. And the unlikely duo immediately form an investigative alliance that is at once highly entertaining and totally unique among novels in this genre. After a back alley fight that’s quickly decided in their favor despite the size advantage of their two oafish adversaries, Pike and Hayes find they are kindred spirits, despite their considerable age difference. Both can handle themselves in a pinch, both love Thelonius Monk, and both have a view of the laws of the land as more akin to guidelines than actual rules. But it’s the next pivotal event that truly bonds this fascinating twosome — the murder of a man in a suburban home that Hayes is about to burgle. His original objective is to recover incriminating photos of one of Pike’s young clients. But he has to beat a hasty retreat when police arrive to investigate. And so, with that, one of the best mysteries this year is well and truly set in motion. Beat Bop is a confidently-written, erudite novel with major and minor characters that rise well above the standard hard-boiled detective fare. More given to flights of philosophy than to fast-paced car chases, this exceptional read is a thinking man’s — or woman’s — noir mystery, steeped as it is in arcane knowledge of past jazz greats and lyrical poetry by the likes of Walt Whitman. But back to the plot, which thickens, as they say, when hoodlums tail Pike ceaselessly, pausing just long enough to fire off a round or two at him. He then must connect the Byzantine trail of dots that pepper the path from the brutal murder of the tabloids reporter in a quiet suburb to the yellow journalist’s unfinished story on a hinky investment firm in the Big Apple. But one of the most satisfying aspects of this book — aside from the salty dialogue and 4D characters — is the ending, which doesn’t offer a happily-ever-after vibe, but rather a sense that characters will play out their own special karma for good or for ill.
We award Beat Bop our very highest rating of five-plus stars. It’s the one mystery this year you won’t want to miss. And, by the way, readers should take note that this is the second Varian Pike mystery created by this outstanding author. Find the others, entitled Hoochie Coochie Man, and Delicious Little Traitor, by clicking the Amazon links below.